Join one of Canada’s leading multidisciplinary providers of community based rehabilitation services treating people who suffered traumatic and acquired neurological injuries, and severe orthopedic injuries in our growing Vancouver practice. 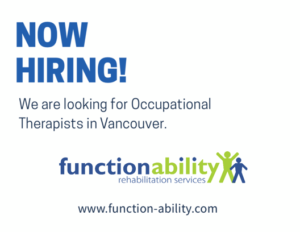 FunctionAbility Rehabilitation Services is currently looking to hire full time Occupational Therapists to join our award winning community based rehabilitation practice providing rehabilitation services to clients in home, work and school settings. We offer competitive pay, benefits and a challenging clinical environment that allows our team members to balance work and family priorities. Facilitate discharge planning for clients from acute care/rehab settings. Assessment and Treatment of individuals suffering from various neurological and orthopedic disorders/injuries. Liaise with various community partners and rehab professionals to facilitate client goals and independence.